Kosher food and nudes. Synagogue prayer and Picasso. What happens when two worlds clash within a single soul? In 2010 I saw a documentary on Orthodox Judaism in Los Angeles, In Her Own Time (1986 – see review). Two things struck me. Anthropologist Barbara Myerhoff­ was a secular Jew, now delving into her religious roots as she faced death: two weeks after the final interview she died of lung cancer. In 2010, my father had cancer of the oesophagus. Secondly, I recall the living room of one observant Jew. There were two bookcases. One held 4000 years of Jewish tradition: commentaries on the Torah or five books of Moses, and the Talmud, 18 volumes of rabbinic laws and discussions. The second bookcase was populated by authors like Sartre and Camus, the leading literati and secular intellectuals of the West. Two rival worlds eyed each other across the carpet. Their encounter is the theme of my favourite new author that year, Rabbi Chaim Potok (1929-2002). Potok was fascinated by what he called “core-to-core culture confrontations”. What happens when two pugnacious ideologies slug it out within a single soul? Most of his novels address this question, with a broadly similar plot. A boy is born with an extraordinary gift that leads to conflict with his ultra-orthodox Jewish community. He feels driven to some Gentile arena, like fine art, Freudian psychology, or scholarship that questions the origins of Scripture. The young man is torn between his family roots and his personal identity, caught in the crossfire between battling texts. He refuses to reject either world but tries to synthesise the two, launching into a perplexing but promising future with “binocular vision”. The quest for knowledge these characters undertake is more thrilling than a Hollywood chase: these teenage lads get high on learning, not dating and rock ‘n’ roll! Most find a mentor whose training is so demanding that I feel like an illiterate slouch, as I do compared to Potok. The Rabbi-writer had a Masters in literature and a Ph.D. in philosophy; he edited a new Bible translation and lectured on post-modernity. It wasn’t for nothing that one of his characters said, “A shallow mind is a sin against God”. Potok stimulates the mind and he also touches the heart. I’m moved by the father-son relationships in his books, which I encountered as I sought to know my dad better before the cancer took him. For Potok, father and mentor often represent the “two bookcases” – a rich but rigid tradition and the brave new realm that our hero is entering. This makes his upbringing tempestuous, though Potok’s fathers can be tender, understanding and wise – especially in his first two novels, The Chosen (1967) and its sequel The Promise (1969). I sometimes gallop to the finish line of a book, impatient to start the next, but lingered over the last chapters of these, reading only a few pages per day, reluctant to say goodbye. I’m drawn to Potok’s characters, and I’m drawn into his world. Potok was born of Polish Jewish immigrants in the Bronx, and he knows every cobblestone of Jewish New York. I love the rip-roaring debates to unravel scriptural conundrums: scholars juggle centuries of commentators – from Babylon to Lithuania, Palestine to Spain – and shuffle Hebrew letters with arithmetic ingenuity. I’m warmed by Sabbath candles and spices, the depth of mourning rites, enraptured dancing with the Torah scrolls that ends the Scripture reading year. I’m sobered by the background rumble of anti-Semitism that threatens family still in Europe, and even overshadows Brooklyn streets. Against the backdrop of 20th century America – from early optimism to stock market depression, World War II to war on communism, Stalin’s death to Kennedy’s assassination – Potok paint a diverse spectrum of Judaisms. We meet Hasidic sects still rooted in 18th-century Poland and progressive sceptics who reinterpret Scripture; mystics of the angelic Cabbala and logical scholars of Talmud; believers in a personal Messiah and Zionists building Israel. 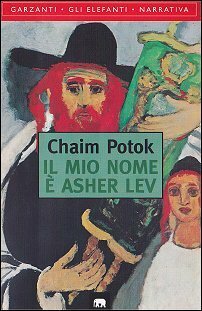 My first Potok was My Name Is Asher Lev (1972). A good place for new readers of the Rabbi to start, it charts the journey of an artistic prodigy from childhood to his 20s. Asher Lev was born in a Hasidic Jewish home, and by four years old begins to “feel with his eyes”. He sees the world as lines and points and planes, shape and texture and colour, and draws it all on whatever comes to hand: paper or margins of books or the walls of his room. I grew up encrusted with lead and spectrumed with crayons. My dearest companions were Eberhard and Crayola. [Pencil and crayon manufacturers] Washing for meals was a cosmic enterprise. Instead of listening to his teachers in class, Asher ponders how to “paint the street crying”, as asphalt glitters, rain drips from maples and “fat drops hurtle through the darkness and explode against the window”. After school he haunts the local stationer’s, sorting brushes, learning to use charcoal for shading and recognise paper type by touch, drooling over tubes of oil colours he can’t afford. Asher Lev’s father Aryeh has a Masters in Political Science and serves the Rebbe, their Jewish sect’s charismatic leader. He travels the world to spread the Rebbe’s message, found schools and rescue Jews from Stalin’s gulags. Like many Jews, he views art at best as frivolous foolishness, if not a vile perversion. Aryeh believes in controlling one’s emotions and selfish drives to live for the sake of heaven, and is enraged that his son – try as he may – just cannot stop drawing. Listen to me, Asher Lev. As an artist you are responsible to no one and to nothing, except to yourself and to the truth as you see it… You must paint the truth or you will paint green rot. Asher Lev, this world will destroy you. Art is not for people who want to make the world holy. You will be like a nun in a bro– in a – theater for burlesque. Despite these warnings, Asher knows he has to paint. Over the next years Jacob Kahn trains him in the tradition of Western, Gentile art, from Greek nudes to Gospel scenes to cubist Picasso. Potok was himself a painter, so Kahn’s thoughts on intra-art confrontations are intriguing. The human body is a glory of structure and form. When an artist draws or paints or sculpts it, he is a battleground between intelligence and emotion, between his rational side and his sensual side… The manner in which certain artists have resolved that battle has created some of the greatest masterpieces of art. There are two ways of painting the world…. One is the way of Greece and Africa, which sees the world as a geometric design. The other is the way of Persia and India and China, which sees the world as a flower. Ingres, Cézanne, Picasso paint the world as geometry. Van Gogh, Renoir, Kandinsky, Chagall paint the world as a flower. “They are swallowing up my world faster than I can paint it.”… I had never felt such emptiness and horror and dread. Riddles, puzzles, double meanings, lost possibilities, the dark side to the light, the light side to the darkness, different perspectives on the same things. Nothing in this whole world has only one side to it. Everything is like a kaleidoscope. That’s what I’m trying to capture in my art. That’s what I mean by ambiguity. Asher’s life reflects this double-sidedness, balancing his Jewish tradition and his artistic calling: daily prayers and Picasso, kosher food and classical nudes, an uncut Jewish beard and abstract expressionism. His father cannot comprehend such fragmentation. No one can live in a kaleidoscope, Asher. God is not a kaleidoscope. God is not ambiguous. Our faith in Him is not ambiguous. From ambiguity I would not derive the strength to do all the things I must do. Ambiguity is darkness. Certainty is light. Asher’s mother is more sympathetic, even buying him oil paints in his youth so he can make pretty pictures of birds or flowers. Her son, however, paints what he sees and feels: a cat struck by a car, a sad old woman with eyes like dark wells, buildings burning in Russian pogroms, the violent colours of family conflict. Much later, in the Florence Cathedral, he sketches Michelangelo’s Pieta. I stared at its Romanesque and Gothic contours, at the twisted arm and bent head, at the circle formed by Jesus and the two Marys, at the vertical of Nicodemus – I stared at the geometry of the stone and felt the stone luminous with strange suffering and sorrow. I was an observant Jew, yet that block of stone moved through me like a cry, like the call of seagulls over the morning surf, like – like the echoing blasts of the shofar sounded by the Rebbe. I’d learnt a little about anti-Semitism at University, but Potok drove that head-knowledge to the gut, so I began to sense the reaction to Asher’s painting, and I felt sick at what Christ means to many Jews. Asher’s father will not pronounce the name of “that man”, who for him represents rivers of Jewish blood, whose followers slaughtered Aryeh’s ancestors from the Crusades to the Holocaust – Asher’s father’s father was killed by an axe-wielding peasant in Russia one Easter night. Asher knew all this, yet painted his mother on a cross, crucified in the window of their Brooklyn apartment where she so often watched and waited in fear that her loved ones wouldn’t come safely home. There was simply “no aesthetic mould in his own religious tradition into which he could pour a painting of ultimate anguish and torment”. Yes, I could have decided not to do it. Who would have known? Would it have made a difference to anyone in the world that I had felt a sense of incompleteness about a painting? Who would have cared about my silent cry of fraud? … But it would have made me a whore to leave it incomplete. It would have made it easier to leave future work incomplete. It would have made it more and more difficult to draw upon that additional aching surge of effort that is always the difference between integrity and deceit in a created work. While critics applauded and collectors snapped up his paintings, to his people Asher Lev was a traitor, a blasphemer, an inflictor of deep shame. Jacob Kahn advised him to “be a great painter… That will be the only justification for all the pain your art will cause”. But what, Asher asked himself, was a drawing in the face of the darkness? Why had the Master of the Universe given him such a cursed gift, or did it come from the Other Side? I looked at my right hand, the hand with which I painted. There was power in that hand. Power to create and destroy. Power to bring pleasure and pain. Power to amuse and horrify. There was in that hand the demonic and the divine at one and the same time. 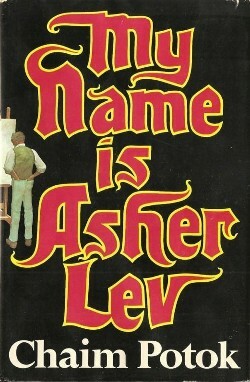 Nearly 20 years later, Potok published a sequel, The Gift of Asher Lev (1990). Here Asher is 20 years older, married with two children, still an observant Jew, still painting, now living in southern France. When his inspiration dries up, the uncle who’d first supported his painting dies, and his wife has Holocaust nightmares, Asher’s old mentor reminds him that tranquillity is poison: “an artist needs a broken world in order to have pieces to shape into art”. In my sealed world, a problem person who crossed over to the outside was briefly mourned and soon forgotten: an enemy all knew how to handle. They stood away from such a person. But a problem person who chose for whatever reason to remain inside became a feared and troubling liability, and ultimately a demonic presence. They didn’t know how to relate to you, because you were inside and outside simultaneously; you blurred the lines of separation; they didn’t know what to tell their children. The lines are also blurred through hints of a hidden harmony between the kings or gurus of the warring realms, the Spanish master Picasso and the Jewish Rebbe. The first novel’s epigraph comes from Picasso, “Art is a lie which makes us realise the truth”. Like Christ’s teaching, the Rebbe’s words are more artistically ambiguous than his followers would like. Truth has to be given in riddles. People can’t take truth if it comes charging at them like a bull. The bull is always killed. You have to give people the truth in a riddle, hide it so they go looking for it and find it piece by piece; that way they learn to live with it. Chaim Potok said he most identified with Asher Lev of his characters. Before he died of brain cancer, he had speculated about a third novel, where Asher might seek artistic forms to portray the Holocaust. During the Depression when they couldn’t afford paper, Potok wrote stories on his bedroom wall – much as young Asher graffitied his – and was torn between Orthodox Judaism and the arts. At 10 years old, Potok wanted to be a painter, but was discouraged by his father and teachers. At 16, he read Evelyn Waugh’s Brideshead Revisited about upper-class English Catholics, and then James Joyce’s Portrait of the Artist as a Young Man about Irish Jesuit schooling. It wrenched my world entirely. I lost all of my friends, I lost most of my teachers, I had to literally reconstruct my existence… My mother was sympathetic; my father, I don’t think he could get over it till the day he died. Potok experienced another sort of “core-to-core culture confrontation” during 15 months as a military chaplain in South Korea, and especially on leave in Japan. A writer is a strange instrument of our species, a harp of sorts, finely tuned to the dark contradictions of life. Potok was surprised at his novels’ wide appeal. Although he wrote about Jews, he received more fan letters from Gentiles, such as a Navajo boy who thanked Potok for helping him live in both his Indian and Western cultures. Potok’s stories speak to such “between people” who find their identity in overlapping worlds. Some of my favourite authors roam the no-man’s-land between church and secular culture, faith and doubt, and have drawn flak from both sides (such as Philip Yancey, Frederick Buechner, Anne Lamott). So did Potok: “Some religionists don’t like my writing, and some critics don’t care for my religionising”. I’ve been blessed with a father who was a University physicist and a Presbyterian elder and saw no inconsistency. Although some Christians are uneasy with my cross-religious researches, I’ve been spared the warfare of Potok protagonists. They sometimes remind me, however of other church groups I have known. In my high school days, Christian clubs screened a video which proclaimed that – in the words of David Bowie – “rock is the music of the devil”; I suspect this forced some musical “Asher Levs” to choose between electric guitars and God. One of my dearest pastors is female, but women who are still forbidden to preach might identify with Potok’s only female protagonist in Davita’s Harp (1985) – as a girl she may not publicly say kaddish, the prayers for her father’s death. The nearest thing I’ve seen to Potok’s ultraorthodox sects was the Exclusive Brethren group at school, girls in long loose hair with headscarves, who sat apart from others to eat their lunch; I’ve heard they were forbidden to speak to anyone who left. Had I been born on that side of the playground, I’d have faced a full Potok battle. …how deep the separating chasm really was and how impossible it seemed to bridge it… I was in between somewhere on a tenuous and still invisible connecting span, and I did not know how to make that span tangible to myself and to the inhabitants of both those other worlds. Maybe it could not be done… Maybe one had to take a stand and abandon one or the other entirely. If the Torah cannot go into your world of scholarship and return stronger, then we are all fools and charlatans. I have faith in the Torah. I am not afraid of truth. Potok understood the pain of those crushed between opposing worldviews, but also knew the gift of binocular vision, the fertility of a mind nourished by two (or more) bookcases. He later returned to his childhood love of art. Blending fact and fiction on his palette, he painted a real-life Brooklyn Crucifixion. To me these are profoundly rich confrontations. As we go about trying to fuse these cultures together, very often, gold is created. We are all of us made richer as a result. As well as the novels and such online resources, I’ve also consulted Potok’s essay “The Novelist and the Bible” in A Complete Literary Guide to the Bible (1993, ed. Ryken & Longman), and Chaim Potok by Edward A. Abramson (1986), the first full-length study of Potok’s work (there are later publications I haven’t read). This entry was posted in Books and tagged art, bildungsroman, Chaim Potok, culture, faith, Judaism, My Name Is Asher Lev, painting by David Titheridge. Bookmark the permalink.